Local complaints have forced Karelian authorities to stick their necks out. This unusual decision was taken ​​by the Svyatozersky Rural Settlement Council in Russia’s northern republic of Karelia. They have forbidden two domestic geese from wandering near Svyatozero Lake (Holy Lake). The owner of the birds, Alexander Pshennikov, was served with the order on an official letterhead bearing the stamp of the Settlement Council. The information immediately spread through social networks and websites, with users describing the ruling as one of the funniest and most ridiculous regulations ever enacted in Russia. The reason for the extraordinary decision was complaints received by the settlement’s administration from local residents. The neighbors were unhappy that the geese, owned by the Pshennikovs, whose yard directly faces the lake, were polluting the shore. “As a result, children could not relax in the lake and people could not rest on the shore,” Ruslan Malyarenko, the head of the settlement, told residents. 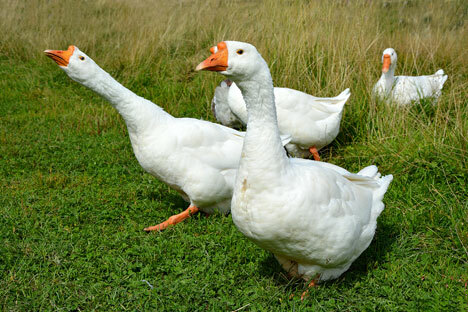 The owners of the geese categorically disagree with this decision. The couple believe that it is simply an attempt to dissuade local people from raising domestic fowl. “They did not forbid them from swimming,” said the perplexed owner of the birds. “So how are they supposed to get to the water? What, do I need to carry them to the lake?